It’s no secret that I love Thai food. It’s just so full of perfect flavor. Sweet, spicy, a little tart, a little salty. It checks all my big flavor boxes. 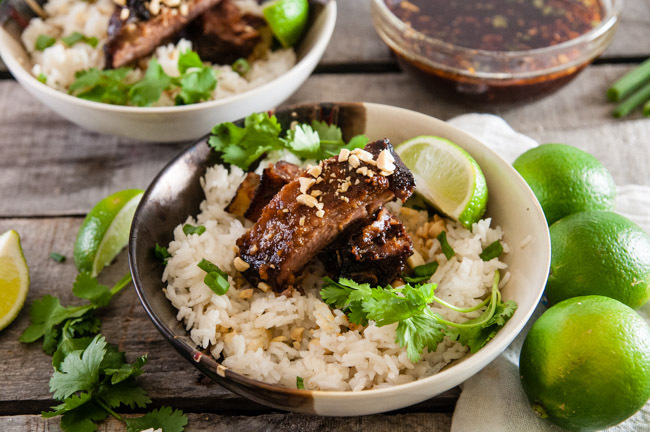 These Thai pork ribs with coconut rice are no exception. 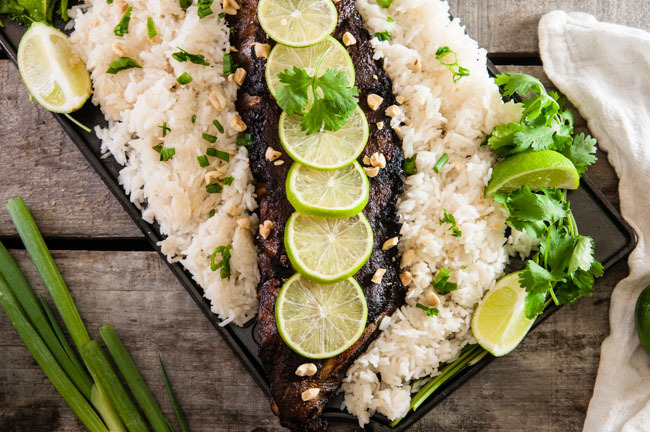 If you’ve never made Thai food it can seem a little intimidating but it doesn’t have to be. It’s actually full of easy to find ingredients. The key is balancing the flavors. You don’t want the sweet component to overpower the tart or salty. When I first started to try to make Thai food at home, I didn’t understand the idea of balancing all the ingredients with a hint of sweet. So my first efforts were sad. Extra sad because I was pregnant with my daughter and wanted nothing but pad Thai and Panang curry. 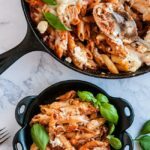 And having the home versions of these dishes fail when I was pregnant and desperately wanted them to be good was seriously tragic for me at that point in time. But I’m not a quitter. I researched. And by researched, of course I mean I ate lots more Thai food. And I googled. And I talked to the restaurant owners where I enjoyed the Thai food. After all this, I discovered I was missing the sweet element. 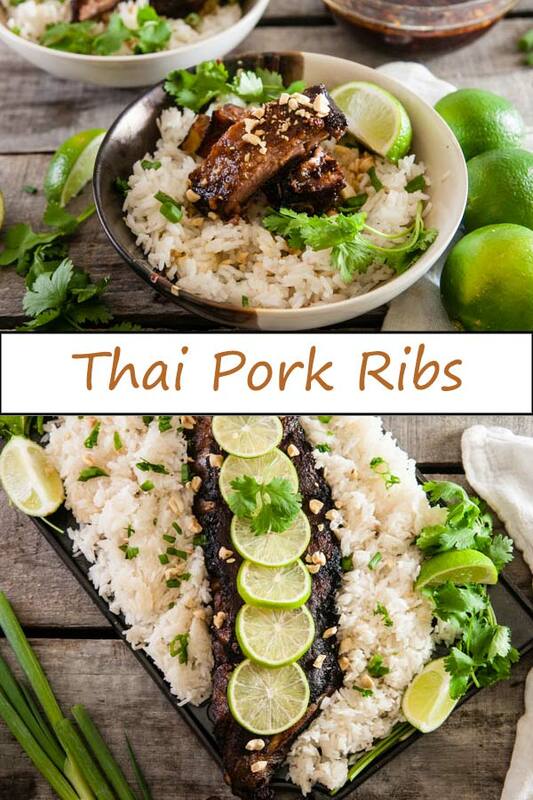 So the moral to the story as it applies to these Thai pork ribs? Don’t skip the brown sugar. Just don’t do it. The sugar adds the balance. You need it. It makes all the other flavors pop. 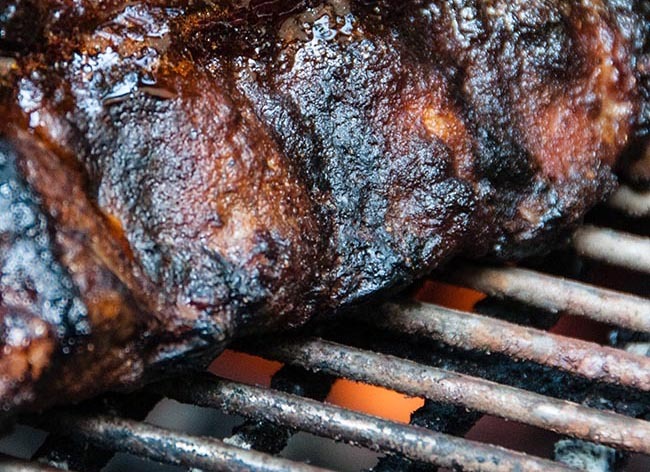 Which makes these ribs extra delicious. Perfect for entertaining especially when the finished product winds up so pretty and delicious. Is it weird that I think food is pretty? 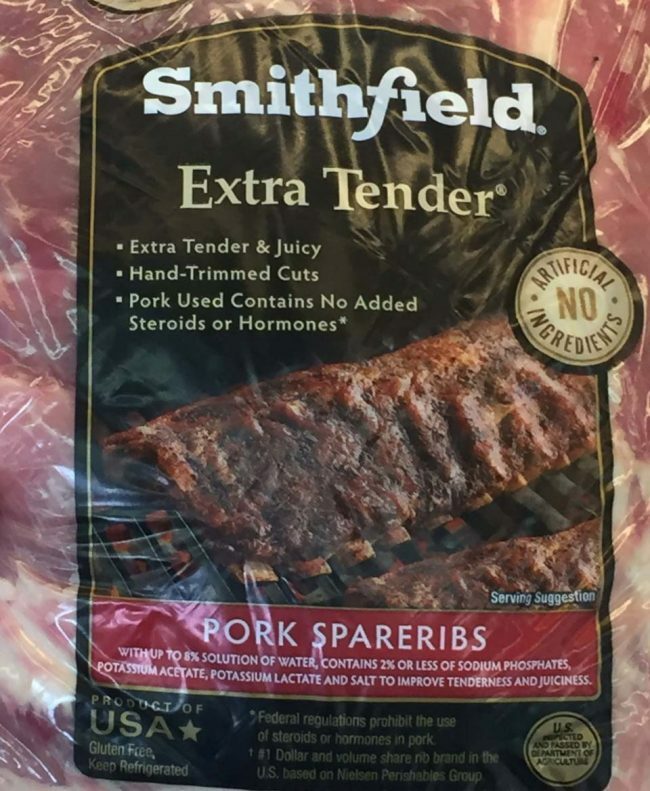 Of course, because they are Smithfield Extra Tender Pork Spareribs you know the quality is going to be good since that is what championship grillmasters choose and they know the importance of high quality meat for great grilled food. For more about them and to enter a chance to win $5000 for your favorite grillmaster, check out the info here. 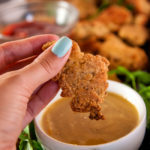 Plus they, along with all the ingredients you need to make this recipe can be found easily at your local Walmart so you just need a quick shop and you are ready to get grilling. 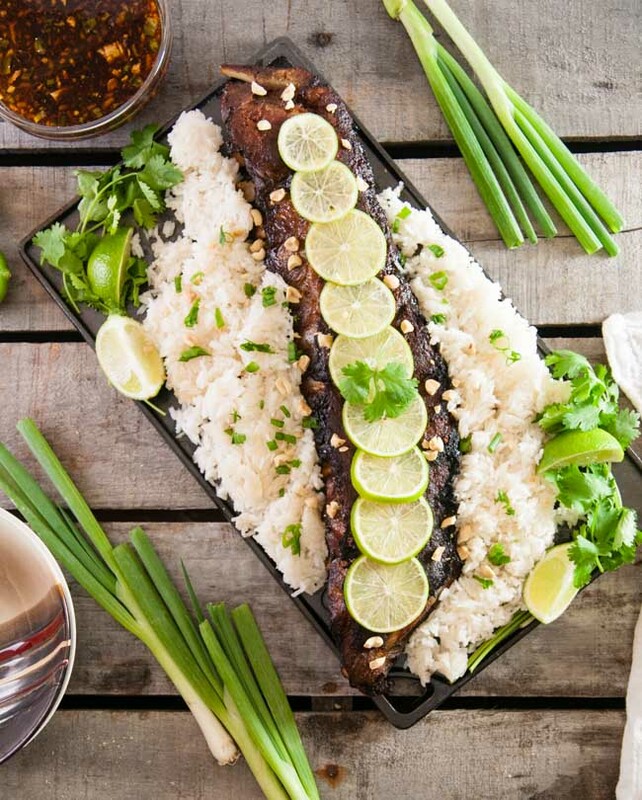 Also, just like Thai food can be intimidating, a lot of people tell me they are intimidated by grilling ribs. There is no need. 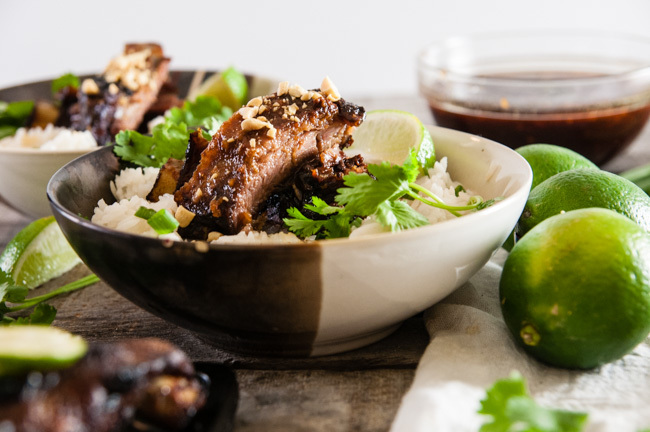 The key is choosing high quality meat and cooking low and slow over indirect heat and you will get amazingly tender fall off the bone ribs loaded with smokey grilled flavor. Check out more grilling inspo here or and these tips below. 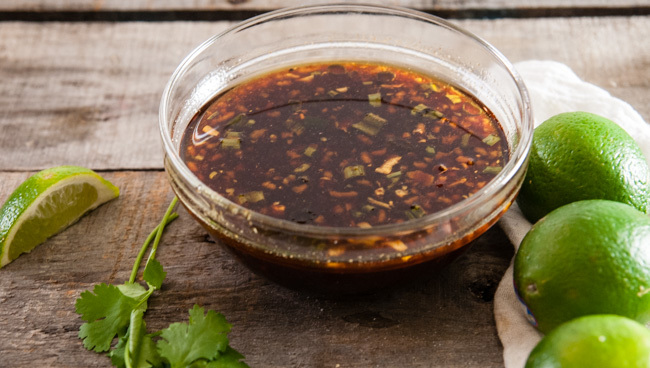 Combine the ingredients for the sauce in a medium mixing bowl. Stir well to combine. For best results, let sit overnight or for a few hours. Cover medium cookie sheet in aluminum foil and spray with non-stick cooking spray or rub with oil. Place ribs, meat side up on the pan. 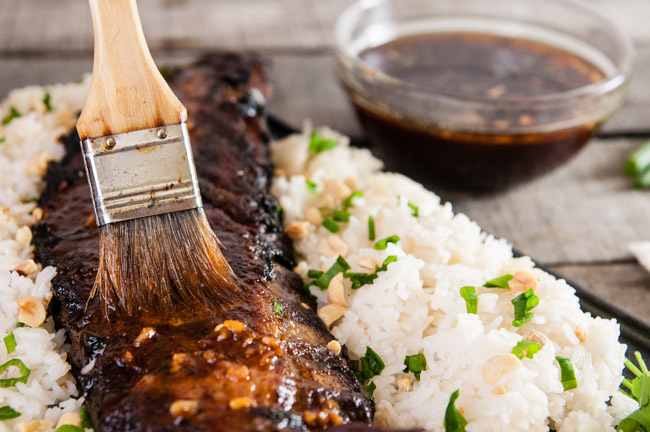 With a spoon, pour some sauce over the ribs and use a brush to spread the sauce across them. Be sure not to touch the spoon to the ribs. 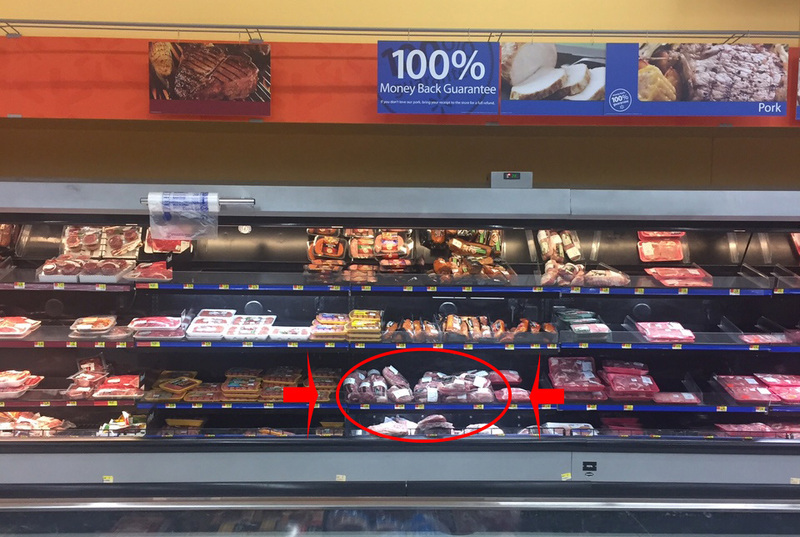 When meat side is covered, flip and repeat process. Let sit in fridge for 1 to 2 hours. Stack the charcoal to one side of the grill to ensure a smokey fire. Place the ribs meat side down over the other side of the grill. Smoke for 6-8 hours, depending on how hot coals are. The ribs are done when the meat begins to fall from the bone or the internal temperature reaches between 190 and 203F for maximum tenderness. About 30 minutes prior to removing from grill, brush with extra sauce. 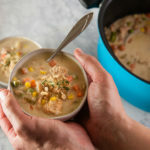 Combine coconut milk and water in a small sauce pan. Add rice. Bring to a simmer and let simmer for 15 minutes or until the liquid is absorbed and rice is fluffy. Remove from heat and stir in lime juice. Oooh I adore all the flavours and dishes from Thailand. 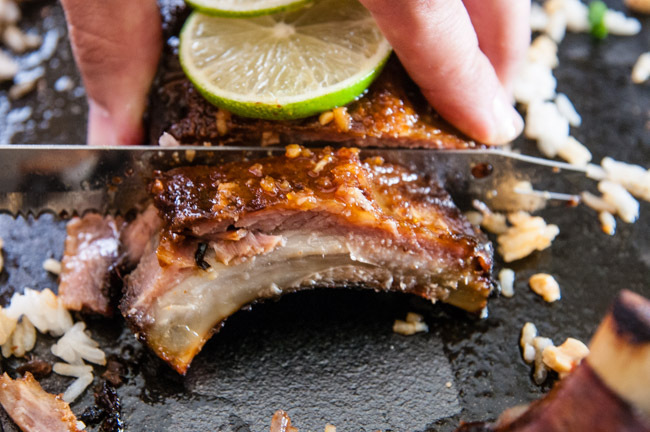 These ribs are right up my alley, they sound amazing! I want to jump right through my screen – this looks SO good! I think I just figured out what I’m making my fiance for Father’s Day! 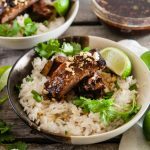 He loves coconut rice and ribs and this recipe sounds crazy delicious! I love your presentation too – I’m gonna have to try to replicate that! 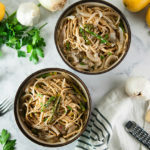 This looks so incredibly delicious! I know my family would love it.